Banbridge Academy aren’t taking anything for granted as they begin their Schools’ Cup campaign on Saturday morning. The Academy host qualifiers Antrim Grammar (kick-off 10.30am) on the back of a few good results. Nonetheless, coach Brian Leslie says they’re not getting ahead of themselves as they prepare for a tough Cup opener. “It won’t be easy but we’re more than happy to have the game at home,” he said. “We haven’t played Antrim yet this year so they’re a bit of an unknown quantity in that respect. Going by our records in our games so far this season, we’ll probably go in as slight favourites but they came through their Preliminary Round well. “I went down to watch that match and they have a very strong out-half and a good centre. “We’ve been doing rightly though. We’ve been on a good run of results lately, in particularly getting a good win over Rainey, who have been seeded into the next round of the Cup. The Academy have been putting the hard work in ahead of Saturday’s big game and have even been warming up with a Cup win. 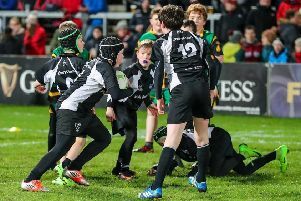 They sealed the Wilson Cup with victories over Armagh and Portadown College but they haven’t taken their foot off the pedal as the look for a good Schools’ Cup campaign. “We were in training three or four times over the Christmas holidays,” said Leslie. “The lads didn’t take a break because of how soon after the holidays the Cup begins. They’ve been working really hard and now it’s time to show what they can do. The Academy will have to do that without star man Richard McNeill. “Richard is injured and won’t play this season at all, which is sad for him, particularly because he’s in Upper Sixth and this is his last year with us,” confirmed Leslie. The Banbridge team will be captained by number eight Matthew Bell and his leadership, aided by vice-captain and scrum-half Jay Pinion, will be essential to the team’s success. Top try scorer and winger Micheal McGaffin along with place kicker, full-back Daniel McElderry will also have key roles to play if the Academy are to have a successful outing against Antrim on Saturday. In the pack, the absence of Ulster Schools flanker McNeill is sure to hurt but the rest of the forwards have rallied to the cause and they will hope to set a good platform for the exciting backline. A large crowd of parents and pupils is expected to watch what is sure to be a tight and exciting game. All support would certainly be welcomed by the players, coaches and the school.